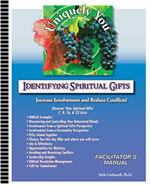 Use this facilitator's manual to lead through the 7, 9, 16, or 23 Spiritual Gifts Only Profile. Spiritual Gifts are supernatural motivations given to every believer. Everyone doesn't receive the same gift. Just as many parts of the human body work together as one, so Spiritual Gifts are given to the Body of Christ to serve as one.